I knew I wanted to do something special when it came to the base for Viktorias, Avatar of Slaughter. 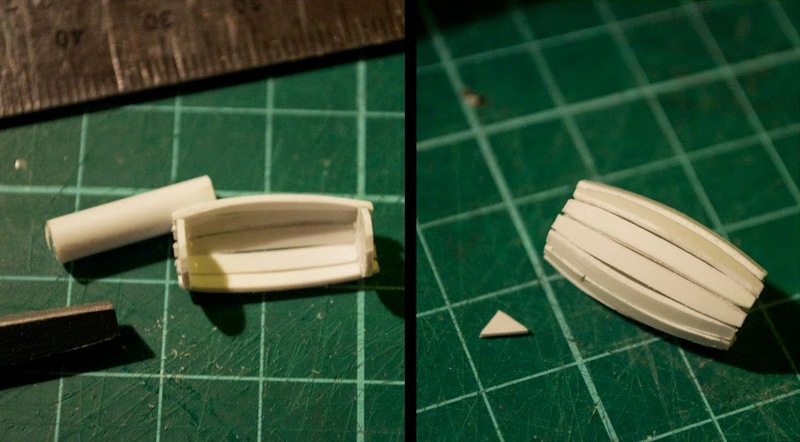 It's a 50mm base, and they're not exactly very large, so there's lots of space to fill. I intentionally kept the bases of the Viktorias crew very straightforward and mundane, because they're meant to be a bit the dregs of the Malifaux world. Cobblestones, dirt, basic pavement, docksides, all preferred for those whose jobs are not taking them into the fancier halls and districts. That said, these are avatars! So what I figured I'd do is combine the mundane roadside with something that would distinctly reference their character. Something appropriate to both. After debating it for a good long while, I had the idea of again using a lantern, but this time depicting it sliced in half, broken to the ground, and a keg split likewise. Both would be victims of the wild sword cuts these two women engage in during their avatar unleash. First up, the road itself, and lamp post. 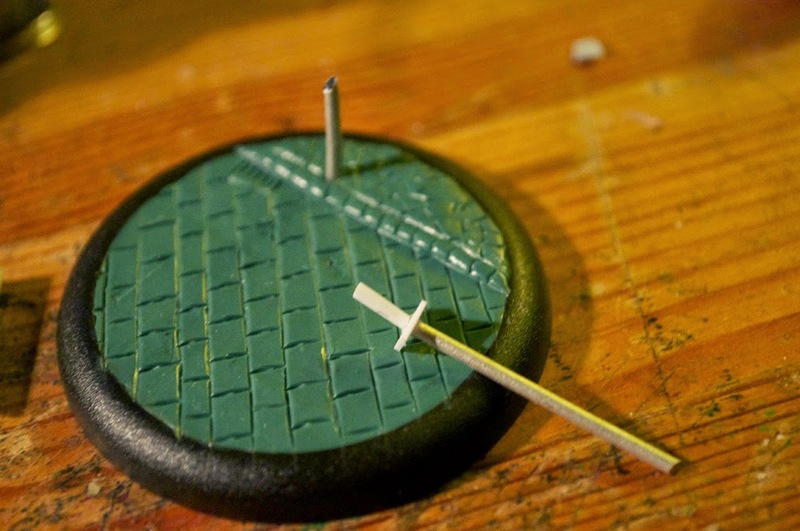 It's the pike shaft whose hand decorates my metal Taelor model, topped with plasticard to form the core of the lantern. I knew I wanted to do clear plexi, since the lamp's been shattered. The road itself was kept as mundane looking as possible, since I still did want people's eye drawn to the model itself, not what they're standing on. Next came careful scoring, the plugs for either end, and a length of plastic rod to act as a spacer in the middle. Eventually, knowing this keg would be sliced in half, it would need to be gone, but while I was gluing the curved pieces in, it was absolutely necessary. 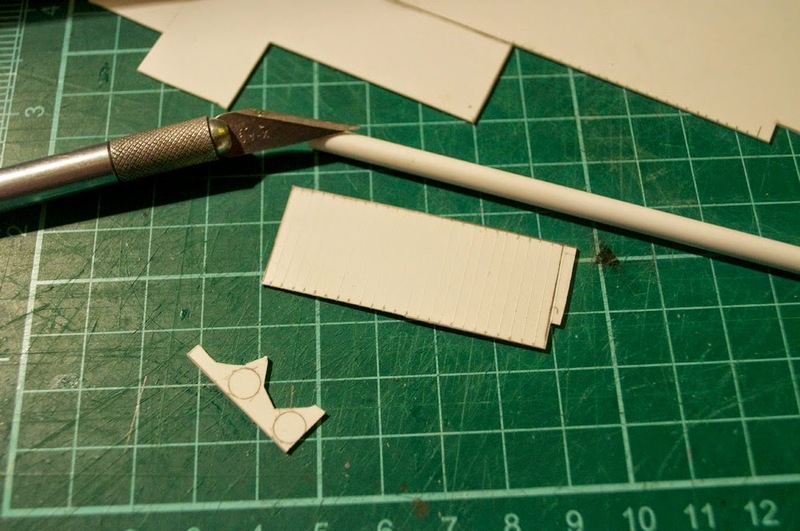 Next, after cutting out each piece, they were filed so they tapered towards the ends. I was okay with them not meeting entirely flush - after all, this is going to be for a wrecked barrel anyway - but I did want them to line up somewhat properly. 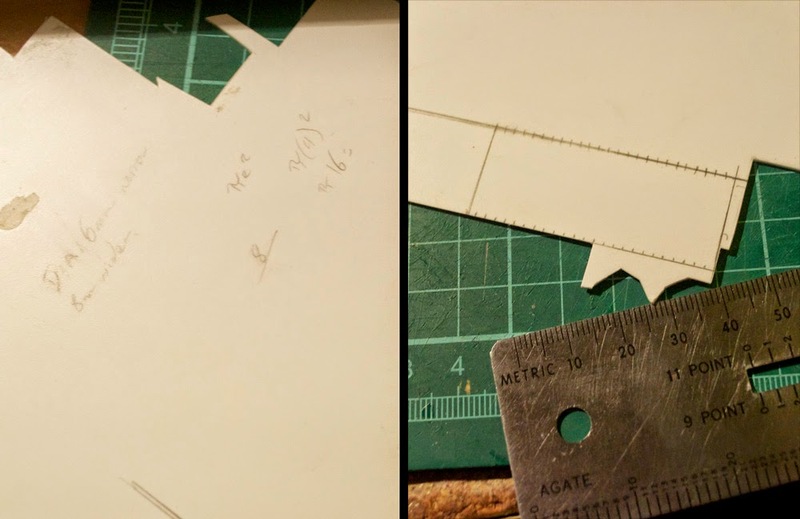 Here my awesome ruler holds them for the camera, and also to keep the drying pieces from accidentally adhering to my cutting surface. Each piece was pre-curved, dry fitted, sanded, and glued in. Once I got near the halfway point, I carefully used a craft knife to extract the central peg, leaving the barrel empty looking but in one piece. I glued the rest of the slats in, and then scored the beams lengthwise to look like wood. Here's the barrel and lamp in place: The barrel was given some liquid greenstuff on the cap to texture like wood, and help adhere the planks. After this I wrapped a thin band of tinfoil around to simulate the metal bands that hold a keg together for real. Next it's painting time! 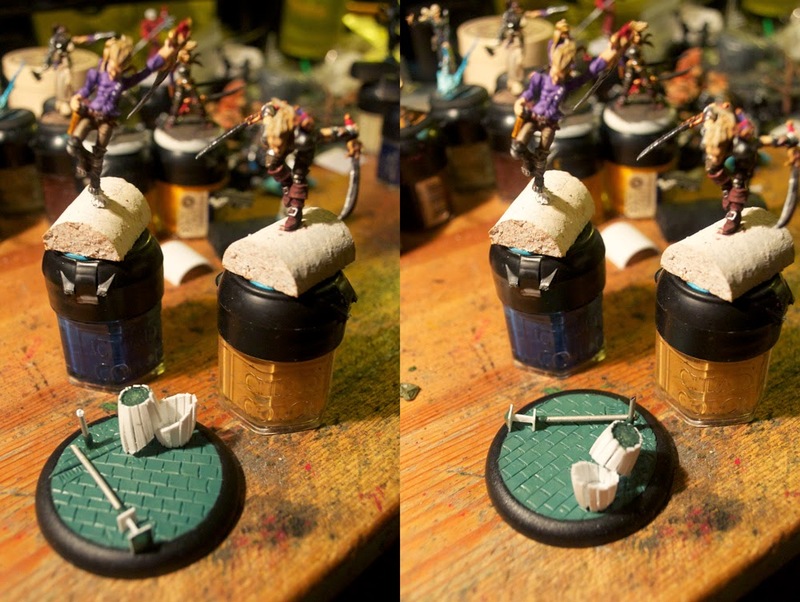 First, the stones get a drybrush of grey, followed by a drybrush of pale sand. 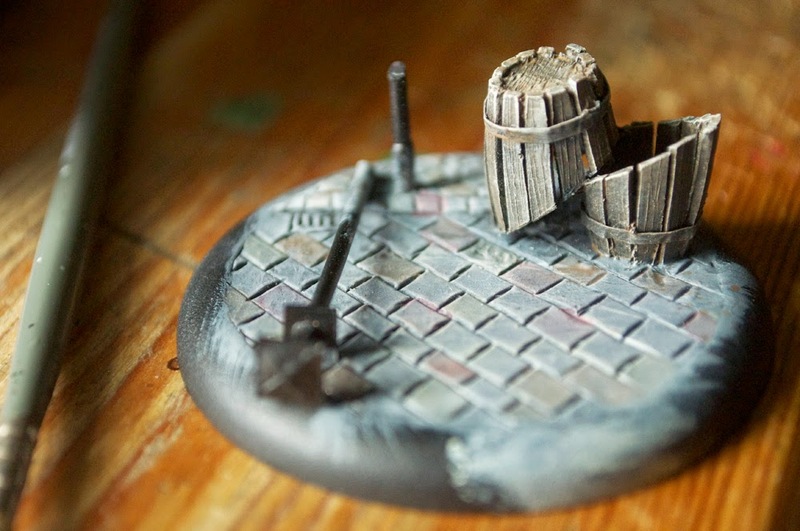 The barrel too at that point got a heavy drybrush of pale sand to make it look like old dead wood. A mild brown wash and some more sand drybrush and it looked appropriately like a nice weathered old keg that would be left out on the street. For the cobblestones, I mixed up a very thin wash of each of the following colours, and selectively picked out stones in: Leather brown, scab red, a pale green, violet, and darker grey. This helps break up the overall drab of the stone, and done subtly enough, imitates the natural colour variance of cobblestones without seeming too brilliant. 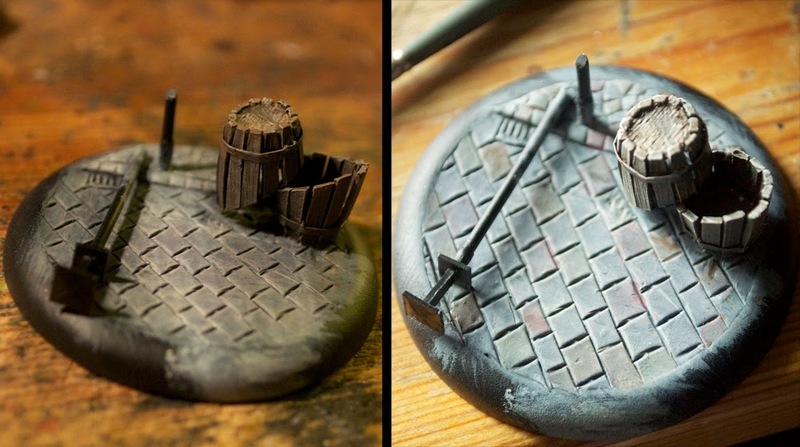 Here's a larger shot of the final stone effects and the keg in weathered form. Note the bands have yet to be painted in a darkened metal colour, nor the lamp post cleaned up to shiny black paint with chips taken off. The final step is adding self-leveling gloss gel to the bucket (in thin coats) and road itself to simulate the water draining out of the barrel and into the drain. 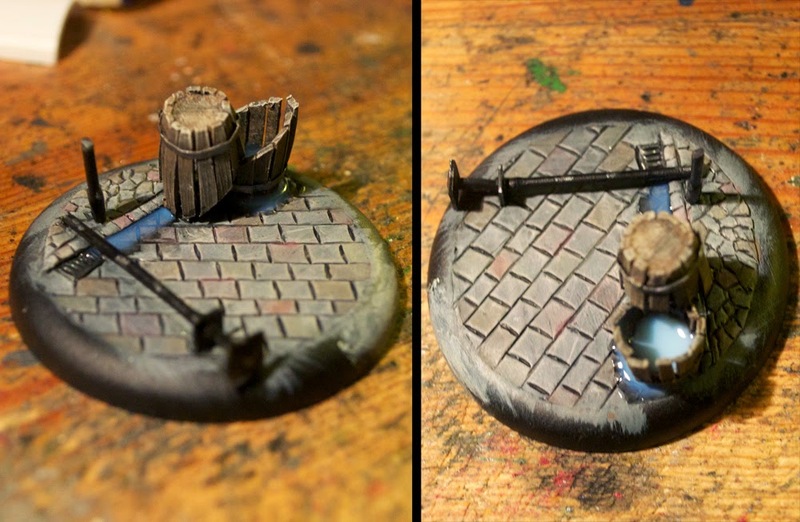 Before painting the ground water, I washed the area it would go with gloss black, to make the stone look wet. And that's the base! As soon as I can photograph and edit the pictures, I'll have my finished Viktorias crew up and online, with the finished Avatars and their base! This Isn't Even My Final Form!! !